This week, I am hosting 20 of the most senior public servants from developing countries all around the world. These officials, from places as varied as Cameroon, Cambodia and the Cook Islands, are gathering at the UNDP Global Centre for Public Service Excellence (GCPSE) here in Singapore to consider how best to implement the Sustainable Development Goals (SDGs). This is a week-long programme on Transformational Leadership for Delivering the 2030 Agenda: Learning from Singapore's Success, run jointly by the GCPSE and the Singapore Cooperation Programme of the Singapore Ministry of Foreign Affairs. The 17 SDGs were agreed on at the United Nations last year as the replacement for the far less ambitious Millennium Development Goals. The goals cover everything from poverty to hunger, natural resources, climate change, prosperity, fulfilment, peace and partnerships. 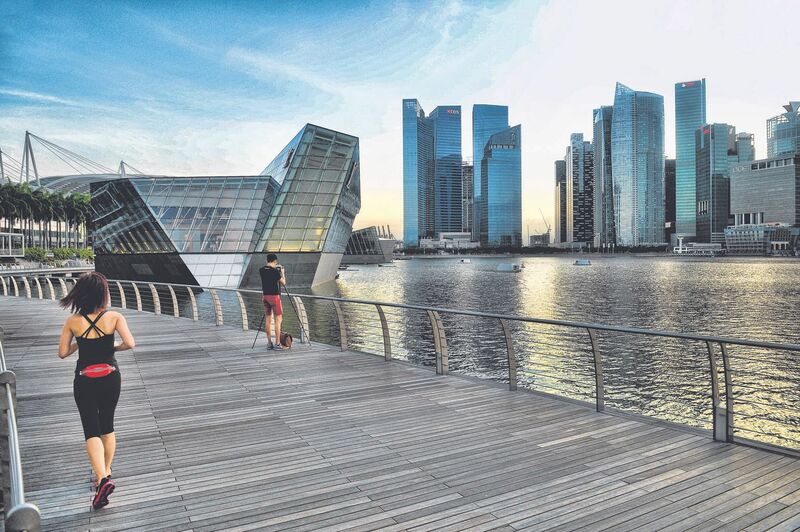 When my visitors look up at the city's startlingly glitzy skyline and wonder how that sprung from the chaotic, smelly harbour of 50 years ago, what can they learn from the Singapore Story of sustainable success that will be relevant? The story of Singapore's developmental success has been articulated many times, from varied perspectives. Most commentators focus on three decisive factors: meritocracy in recruitment and promotion for all government jobs, zero tolerance of corruption and enlightened leadership. All agree that core to Singapore's astonishing speed of progress was an honest, committed public service. However, when Singapore began its modern developmental journey as a brand-new nation in 1965, the world was a less complex place. Citizens today are more educated, increasingly globalised in outlook, and better networked with counterparts in other countries than ever before. Technology is pervasive to a degree that few could have imagined in the 1960s. Predicting the future is, oddly enough, becoming harder. The realm of "unknown unknowns" is probably growing, and certainly more significant today than it was 50 years ago. The natural environment also seems more unstable; the scope and scale of natural calamities of the last few years are unprecedented. Developing nations today face a more complex environment than Singapore and other now- developed countries did when they were undergoing the transformation. Nonetheless, Singapore's astonishing achievements remain a beacon of hope and inspiration for nations still struggling with their own developmental trajectories. Singapore in its early days benefited from two decisive factors: the quality of its political leaders, and of its public service. The political leadership was visionary and focused on nation-building. The public service was efficient, corruption within its ranks was ruthlessly and decisively stamped out, and its officers wholeheartedly embraced the nation-building ambition. This effective "political/administrative leadership interface" was the superstructure upon which the economy, healthcare, education and other components for transformational development could be supported. In short, both political leadership and the civil service were imbued with an intrinsic sense of public service motivation. This was an attribute lacking in many other developing countries at that time, and unfortunately still to this day. Why is this attribute even more important now than half a century ago? The international community, in adopting Resolution 60/34 of the United Nations General Assembly on Public Administration and Development of 2006, agreed that "an efficient, accountable, effective and transparent public administration is a key driver of social and economic development and has a key role to play in the implementation of internationally agreed goals". Yet research suggests that the public's trust in government is in sharp decline in many parts of the world (for example, De Vries and Kim, 2014; Newland, 2015: 39-63). This applies even though government performance has improved on many fronts. This low trust in government undermines quasi-voluntary tax compliance, diminishes the willingness to pay for public services, and decreases morale of officials. Besides increasing complexity, governments today also confront significant new pressures on public service. While citizens demand better services and want to participate in policymaking, they are not content just to be presented with efficient service. Public officials are frequently being told to be more "people-centred" and "entrepreneurial", meaning that risk aversion should be replaced by greater tolerance of risk. It is far from clear whether the bitterly partisan politics that exists in many countries really can embrace that change. Yet governments will have to adapt and respond dynamically to situations that change more often and more rapidly. Research also suggests that trust in government and state legitimacy are not primarily created by democracy, the rule of law, or efficiency and effectiveness, but are the outcomes of "the impartiality of institutions that exercise government authority". And "one of the most interesting findings from the research on happiness is how much the quality of government and the trust and confidence people have in their public officials contribute to well-being" (Derek Bok's The Politics Of Happiness). So the reason people are increasingly losing confidence in their governments seems to be that almost everywhere we confront a steadily widening gap between reality and rhetoric, between hard fact and fiction, in public life. (Hood and Dixon 2015:12). Where to start on reversing this? Less well understood in the story of Singapore's developmental success was the importance of creating a strong intrinsic motivation. This can be summed up as its ability to instil Pride in working in the public sector, maintain the Prestige of posts in public service, and imbue a strong sense of Purpose in public officials. Along with this came what I call the Politics of Practical Pragmatism. Senior officials understood and embraced the reality that Politics was a fact of life that needed to be managed rather than avoided, developing an approach to problem-solving that was not ideological but Practical and Pragmatic. It is apparent that the formula worked. In facing the development challenges of the 21st century, the public service and political leaders in developing countries of today need to have the same intrinsic public service passion as their counterparts did in the Singapore of the 1960s. • Max Everest-Phillips is the director of the GCPSE, which was jointly set up in 2012 by the United Nations Development Programme (UNDP) and the Singapore Government.